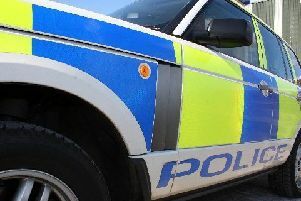 Police in Midlothian are appealing for witnesses following an armed robbery in Penicuik. The incident happened around 9.25am on Saturday at the Tesco filling station on Edinburgh Road. A man entered the premises and brandished a machete at two members of staff before stealing a three-figure sum of cash from the tills. The suspect then made off and was seen by a member of the public running from the forecourt, up Cuiken Terrace and making his way onto Carlops Avenue. Inquiries are ongoing to trace this male and anyone who recognises him is asked to come forward. He is described as being white, late teens to early twenties, around 5ft 8ins tall with a medium build, short blond hair. He was wearing a black, tight-fitting hooded jacket with logo on the breast pocket, grey cotton tracksuit bottoms and dark-coloured shoes. Detective Sergeant James Welsh, from Dalkeith CID, said: “This was a terrifying incident for the staff within the petrol station, though, thankfully, neither was injured as a result. “We are conducting significant inquiries within the Penicuik area to identify the suspect and anyone who can assist us is urged to contact police immediately. Those with information can contact Dalkeith CID via 101 and quote 1373.